Fry 1 finely chopped shallot and 1 garlic clove in butter for a few minutes in a saucepan. Next add about 200ml white wine and the clams. Turn the heat up high and put a lid on. 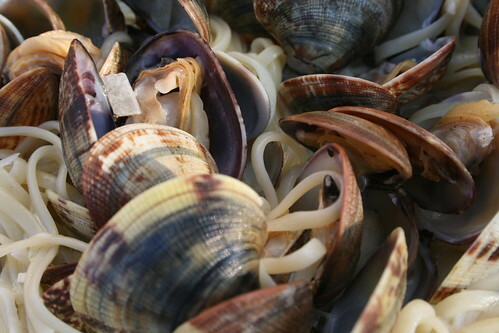 Remove from the heat when the shells open. At this point remove the clams from the pan and add 100ml cream, salt, pepper and juice of half a lemon to the pan. Bring to a boil and simmer until it is reduced to a sauce consistency. 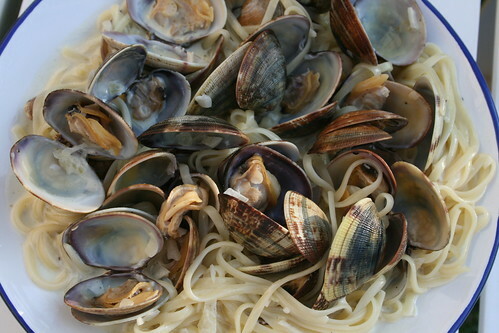 Meanwhile cook the linguini and once the sauce is ready and the linguini to the pan along with the clams to reheat them.